Steven Chu – in a video recorded before he was named Energy Secretary – gives an analogy to our current situation – “Titanic: The Sequel”. As the commentator above relates, and as the US Geological Survey affirms, humans release 100 times more CO2 annually than all the world’s volcanoes. When you hear this canard, point your denialist friend to the USGS Volcanic Gases and Climate page, where they can read it from the horse’s mouth. Do the Earth’s volcanoes emit more CO2 than human activities? Research findings indicate that the answer to this frequently asked question is a clear and unequivocal, “No.” Human activities, responsible for some 36,300 million metric tons of CO2emissions in 2008 [Le Quéré et al., 2009], release at least a hundred times more CO2 annually than all the world’s degassing subaerial and submarine volcanoes (Gerlach, 2010). North Cascades Glaciers. A New Film project. Mauri Pelto is director of the North Cascades Glacier Climate project, and has been a resource and advisor to this series. This past summer, a film crew accompanied Mauri and his team to a survey trip in on the ice. A movie is in the works. The video is a snapshot of an ongoing film project on the fate of Cascades Glaciers. Interested viewers may read more and contribute here. 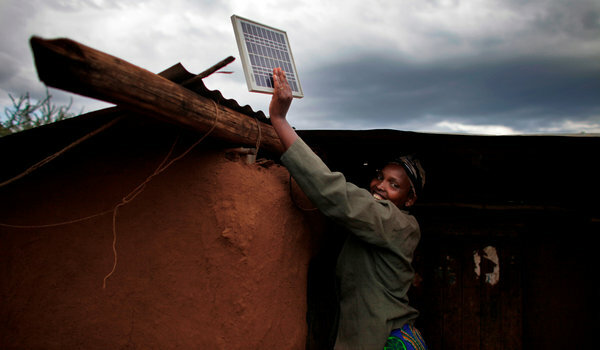 The New York Times profiles the impact that small scale solar technology can have on rural areas in the third world. For decades, Big Energy advocates have cast themselves as compassionately wishing to end suffering of rural poor in the third world. But gigantic energy projects, thermal power plants, dams and the like, don’t solve the problem of rural poor in places where there is no electrical grid. Just as third world nations have “leapfrogged” the need for expensive and unwieldy telephone land line connections, by going directly to widespread satellite phone technology – small scale solar photoelectric has the promise to bring appropriate scale technology to those who need it most. Good Morning Sierra Leone. This is Biochar. Quick primer on Terra Preta, or Biochar, which is a method of sequestering carbon in soils, that enhances soil quality, and may be part of the solution for stabilizing atmospheric Co2. Now, check out one application of the Biochar idea, in a fascinating glimpse of media in a third world country, covering an important appropriate technology initiative, bringing high efficiency stoves to rural populations, to address issues of climate, deforestation, air pollution, nutrition and health. Who knew there was a “Good Morning, Sierra Leone”? Welcome to the New Normal, courtesy of Climate Change. Edmonton Journal. - Click for Larger Image. Hanneke Brooymans, writing in the Edmonton Journal, documents how Canadians are feeling the same seismic shift that human beings the world over have sensed in recent years. We are living on a rapidly changing planet. EDMONTON – In April this year, farmers in large swaths of Alberta were staring morosely at dusty, parched fields. A few months later, some of the same farmers were coping with floods.